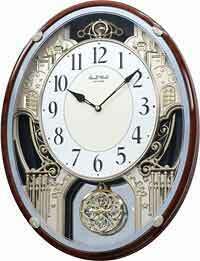 Rhythm Clocks are one of the largest clock companies in the world with sales of over twenty million clocks since the company was founded in 1950. Rhythm Clocks separates itself from other companies by it's investment in the development of state-of-the-art features which included motion and sound clocks by Rhythm Clocks. Rhythm clocks designs and builds all of it's products in their own factories worldwide to offer total control of quality during manufacturing. 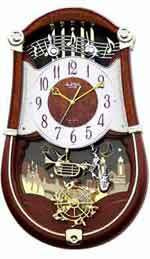 Rhythm clocks is a worldwide company that has a reputation for quality and design. 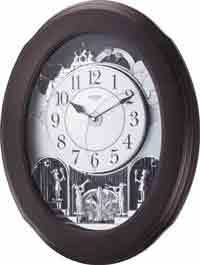 Discount Rhythm Clocks and Small World Rhythm Clocks at the Clock Depot with Free Shipping. The Rhythm 4MH400WU06 Joyful Meditation musical wall clock is a vision in gold. The area inside the Solid Oak wood frame is featured in a brushed Gold color. The city scene at the top has a polished gold color. The dial is exquisite with 6 Swarovski Crystals on the dial as well as 15 crystals behind the dial and finally 16 crystals on the rotating pendulum. On the hour this clock will play one of 18 melodies while the dial separates into 6 sections that rotate and display clear plates with Instruments and music notes. The Joyful Meditation features 18 melodies, in 3 banks, automatic nighttime shut-off, volume control, on/off switch, and a demonstration button. This clock is battery operated and 2 "D" batteries are included. Size: 21" H. x 16.5" W. x 4" D.
This Nautical theme clock splits the worlds in half on the hour to reveal spinning dolphins and a compass with multi color crystals. 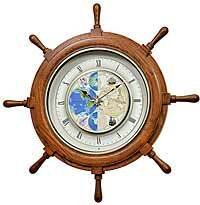 Solid Oak Ships wheel frame makes this a truly beautiful piece. One of 30 melodies will play on the hour during daylight. One year warranty and Free Shipping. 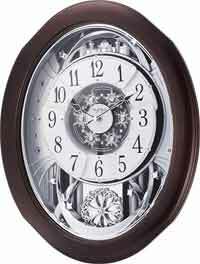 Size: Width 25" x Height 25"
This eye-catching musical wall clock entrances you at the top of the hour, as the numbers rotate to reveal swans and dancers. The rocking pendulum on this model keeps this clock in a state of constant movement. The clock rotates through one of 30 legendary melodies that will have you desiring an "encore". 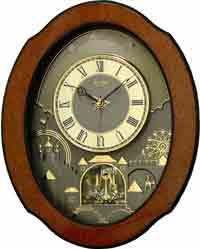 The clock has a wooden case, volume control, demo button, auto off night sensor, and comes with four "D" cell batteries. Size: H. 22" W. 16" D. 5"
Rhythm Peaceful Cosmos II has three musical settings playing one of 12 Popular and Hymns, 12 Americana melodies or 6 Christmas melodies. Swarovski crystal pendulum rotates continuously. Quartz, battery operated movement. Plays 30 Melodies. The clock will play a different song, at the top of every hour, within the music setting, in rotation. This clock is equipped with a light sensor, that will automatically silence the clock, when your room is dark. Automatic Night-time Shut-off, Demonstration Button, Volume Control, ON/OFF Switch, Two "D" sized Batteries are included. One year warranty and Free Shipping. 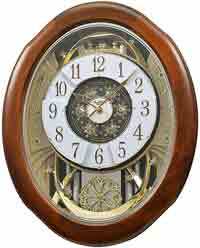 The Rhythm Woodgrain Marvelous 4MH412WU23 musical wall clock has a faux burl wood frame. 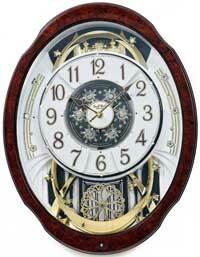 The constantly rotating pendulum at the bottom of the clock is flower shaped and features 17 Swarovski crystals. The Arabic numerals are brown with gold trim around each one. The hour and minute hands match the numerals exactly. On the hour, the dial will open up into 6 separate sections. Behind the numerals are white panels with gold music notations. LED lights will flash and the number tiles and music panels will dance around the face each hour to one of 30 melodies. One Year Warranty and Free Shipping. Size: 20.6"H. x 15.9"W. x 3.87"D.
The Rhythm 4MH417WU06 Joyful Essence Small World Magic Motion Clock features 30 melodies in 3 banks. The Solid Oak frame surrounds a dial that separates into 3 pieces on the hour. As the face opens up 5 bells are revealed that rotate as the melody plays. The white face has a gold bezel and black Arabic numerals that are easy to read. The black spade hands are large enough to be seen from across the room. 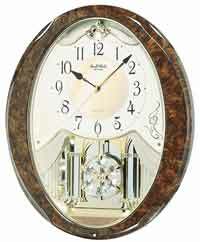 The continually rotating pendulum features Swarovski Crystals. One Year Warranty and Free Shipping. 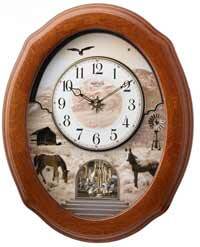 Size: 20.7"H. x 16.5"W. x 4.05"D.
The Rhythm Joyful Prairie offers a western scene with a desert background with an oak frame. One the hour, the dial divides in two while one of 30 melodies play. A rotating crystal pendulum move within the bottom of the case. Clock is quartz battery operated and has a light sensor so the clock may turn off in low light, night-time environments. There is also a volume control and an on-off switch for for the music. Two "D" sized Batteries are included. One year warranty and Free Shipping. 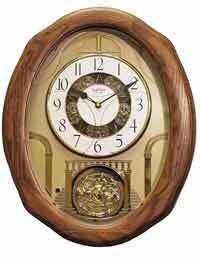 Rhythm 4MH419WU06 Joyful Timecracker Oak Musical Clock in a beautiful oak frame that can play 30 beautiful melodies. Every hour the face separates into two sections and revolves around as one of 30 beautiful melodies plays. There is a Demo Button which will play a melody when pushed, volume Control and a light sensor for Auto Night Shut-Off. One Year Warranty and Free Shipping. Size: Height 20.4", Width 16.7", .Depth 4.05". Rhythm 4MH428WU06 Velvet Cosmos wall clock is wrapped in an elegant dark Merlot colored frame where on the hour the dial separates into sections. On the hour the planet Earth dial the splits in two to reveal even more splendor beneath. Four Swarovski crystals are built into the rotating pendulum. Clock is battery quartz operated. Plays one of 30 melodies every hour on the hour from 3 different melody selections. One year warranty and Free Shipping. 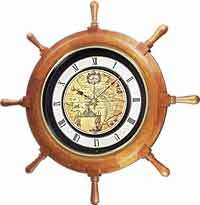 Size: Height 20.4", Width 16.7" Depth 3.78"
The Voyager Classic by Rhythm is a nautical style clock fashioned to look like a ships steering wheel. The dial has an 17th century sailor's map of what is now North and South America and the Pacific Ocean. The ship's wheel case design is made of real wood. During the rotation of the dial the opening shows 3 spinning dolphins and a compass dial. The clocks melodies are split up between 3 different banks, 12 popular melodies, 12 classical melodies, and 6 Christmas melodies for a total of 30 melodies. The ship's wheel case design is made of real wood. The Voyager Classic has a Quartz movement that requires 2 size D batteries (included). One Year Warranty and Free Shipping. Size: Diameter 25", Depth 3.5 "
Rhythm Joyful Moment musical wall clock uses a faceted frame with colored LED lights that flash and Sync to one of 18 melodies that play on the hour. The lucite burl wood colored frame frames the sides. Real Swarovski Elements are embedded into the clock. This one is reminiscence of the vintage Wurlitzer Juke boxes. A rotating wheel turns while the two sets of bells rock in a perpetual motion. Clock is battery operated. 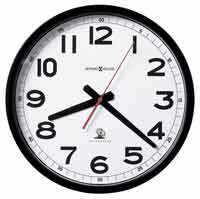 A demo button is located at the bottom of the clock. Clock is quartz battery operated and has a light sensor so the clock may turn off in a low light, night-time environment. There is also a volume control and an on-off switch for for the music. Two "D" sized Batteries are included. One year warranty and Free Shipping. Sounds of enjoyment come from this carefully crafted viola shaped timepiece. The combination of the pendulum rocking at the top of the clock and the spinning pendulum at the bottom make this piece a true entertainer. The LED lights add to the rhythm of this clock as they are synchronized to each of the 30 melodies. other features include a demo button, Volume Control, auto night shutoff and batteries are included. 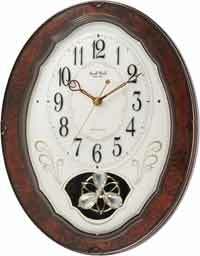 Rhythm 4MH830WD23 Enchantment Musical Wall Clock with a red mahogany colored burl wood design on the glass. At the bottom of the dial there is a revolving Swarovski crystal wheel and a unique swinging pendulum holding 4 figurines that rock up and down. The Enchantment rotates between 18 melodies which include Classical, Popular and Christmas Carols in three separate banks. 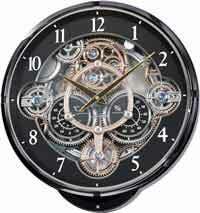 Accurate Quartz musical movement is powered by 4 C Batteries which are included. One Year Warranty and Free Shipping. Size: Height: 20.2", Width 13.5", Depth 3.27". 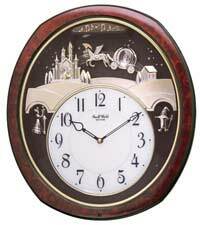 This Nostalgia series model is a state-of-the art creation comprised of 30 melodies inclluding Folk, Classical and Christmas tunes by Rhythm Clocks. On the hour, the dial opens and splits into three sections revealing five golden bells. The beautiful piano-finish cherry frame along with the crystals and gold and silver accents, make this clock a truly elegant addition to any home. Clock is battery quartz operated. One Year Warranty and Free Shipping. The Rhythm Marvelous Small World clock has a total of 38 different colored crystals. On the hour, the dial opens into 6 sections revealing instruments and music notes that rotate to one of the 30 melodies. 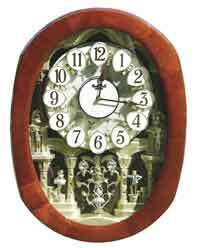 The flower-shaped wheel at the bottom of the clock steadily rotates and is embellished with crystals. Accurate Quartz movement is powered by 4 D Batteries which are included. One year warranty and Free Shipping. Size: Height: 20.6", Width 15.9", Depth 3.87"
This model is in a class of its own. The eye catching design fascinates with the motion of the numbers at the top of the hour, as the numbers rotate to reveal crystals and angels. 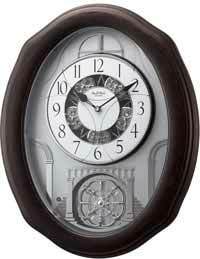 The swinging pendulum on this model keeps this clock in a state of serene motion. Plays one of 18 melodies every hour on the hour from three different settings. The clock has a wooden case, volume control, demo button, auto off night sensor, and comes with four "D" cell batteries. One year warranty and Free Shipping. The Rhythm Joyful Land offers a great selection of 18 melodies and nice motion at a lower price. The Joyful Land plays Christian Hymns, Folk tunes and Christmas Carols! Switch between the 3 categories at will. Every hour on the hour, the clock plays one of six melodies. An auto-night shutoff feature turns the music off when it gets dark. Pendulum swings continuously. Demo Button, Auto Night Shutoff, Volume Control, On/Off Switch, Batteries Included. One Year Warranty and Free Shipping. 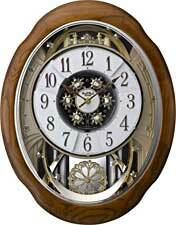 The Joyful Nostalgia Oak offers 18 melodies where one will play on the hour while the dial opens into three pieces reveling five golden bells that rotate within a circle. LED lights will blink with the music in the background. When the sections are fully open, it is like the pedals of a flower. Sedona Oak finish on solid Oak. The crystals are Swarovski® Elements. Demo Button, Volume Control and auto Night Shut-Off. Operates on 2 D Batteries that are included. Size: 20.7" H. x 16.5" W.
The dial of the Rhythm 4MH858WU23 Gala turns upside down every hour as it plays one of 30 different melodies. The Rhythm Gala plays 12 Americana Melodies or 12 Classic Melodies or 6 Christmas Songs by selecting from the switch to change your selections. The Gala also features a volume control, demonstration button, light sensor that turns off the sound in the dark and an On/Off switch. One year warranty and Free Shipping. 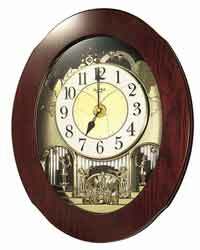 Solid Oak contoured frame with a dial that rotates while playing music on the hour. The Rhythm American Gala Musical clock features a dial that rotates every hour on the hour as it plays one of 18 different melodies (6 Popular American Melodies or 6 Hymns or 6 Christmas Songs). Solid Oak frame and a glass crystal. Auto-night sensor and a volume control for the music. On the hour plays one of 18 songs from one of three banks. One year warranty and Free Shipping. 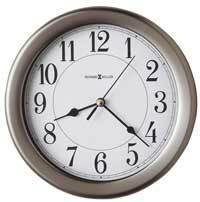 Size: Height 16.26", Width 14.17", Depth 2.95"
Rhythm 4MH864WU06 Timecracker wall clock has many quality features. The Solid wooden frame surrounds the black background with brass accents that give this model a classical appeal. You choose one of the three banks of melodies and the clock will rotate through one melody every hour as the dial separates in half and the inner working spin. The spinning pendulum holds four crystals and keeps a smooth constant rotation. The clock has a quartz battery operated movement. The Rhythm Chateau 4MH865WD23 plays 30 different melodies in three selectable banks. (12 Popular Songs, 12 Classic Songs, and 6 Christmas Songs) Just flip a switch on the side of the clock to make your selection of which group you wish to hear. This clock also features a demonstration button, auto night shut off, volume control. It uses 3 C batteries that are included and has One year warranty and Free Shipping. Size : H 15.5', W 11.75", D 2". This angelic timepiece is truly a blossom beauty. At the top of the hour, the numbers rotate to reveal the presence of angels and six Swarovski Crystals. The numbers dance to 30 different melodies at the top of the hour. 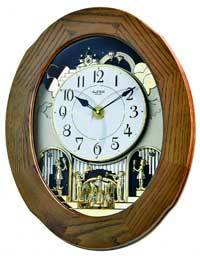 The clock is encased in a beautifully crafted light oak frame. 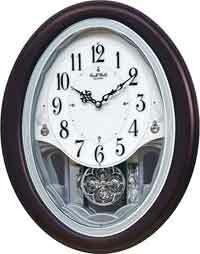 Clock is battery quartz operated powered by two "D" batteries which are included. Size Width 15.2" Height 15.2" Depth 4.1". The Nostalgia Espresso is an elegant clock that features 30 melodies. As the hour strikes, the dial separates into three sections to reveal silver-finished rotating bells. The constantly rotating crystal encrusted pendulum has 5 crystals that catch the light. The beautiful satin espresso-finished solid wood frame surrounds the contemporary silver face. The dial has Arabic numerals and black spade hands. Swarovski Crystals are embedded in multiple locations on the dial with 15 more behind the dial and 16 on the rotating pendulum. During the daylight hours the dial opens into 6 sections revealing instruments and music notes that rotate to one of 30 well known melodies. The melodies include 12 Popular / Classical melodies, 12 Classic melodies and 6 Christmas melodies. This clock requires 4 D size batteries which are included. The music has an on / off switch and a Light Sensor Shutoff so the clock may be silent in the evening hours. There is also a volume control for the music. One year warranty and Free Shipping. Size: Height 20", Depth 16"
The Gadget by Rhythm is a multi-function clock that has a Thermometer to read the temperature, a hygrometer to tell you the moisture in the room, in addition to telling time. The clock plays one of 30 different melodies on the hour. The light sensor turns the melodies off when the room is dark. The Gadget has a One Year Warranty and Free Shipping. Size: H - 16.1", W 15.4", D - 3.5"
The Widget wrapped in a burl wood design. It reads the temperature, moisture, has motion, and it tells time. 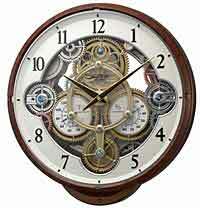 On the hour, the gears take move; meanwhile the dial takes a full revolution around while playing one of 30 melodies. LED lights flash along with the melody. Designed beautifully with a continuous rotating gear at the bottom and 6 Swarovski Crystals. One year warranty and Free Shipping. Size: Height 16.14", Width 15.35", Depth 3.39". The Concerto Entertainer by Rhythm Clocks features 30 songs including 12 Popular American Songs or 12 Classical Songs and 6 Christmas Songs by Rhythm Clocks! The Concerto Entertainer motion includes small musicians rotating and trumpet & saxophone pendulums swing back and forth continuously. Just flip a switch on the side of the clock to make your selection of which group you wish to hear. Rhythm Clocks Concerto Entertainer also features a demonstration button, auto night shut off, volume control. One year warranty and Free Shipping. Galaxy, The Ideal Kids Clock with a space shuttle theme that has space ships that rotate around the dial bearing an image of the Earth. The spacesuit man swings continuously to give the Galaxy that magic touch. Auto night shut off, volume control and on/off switch. Batteries are also included. 30 Melodies are onboard and rotate on the hour. One year warranty and Free Shipping. 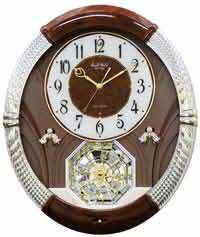 Size: 14.6" H. x 14.6" W.
The Rhythm 4MH895WU06 Glory Espresso is an extremely elegant clock with the contemporary color scheme of Espresso wood frame and silver background, this clock will fit into the decor of most homes. 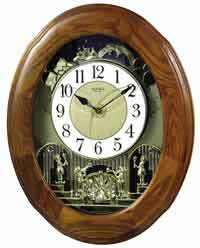 The beautiful all wood frame surrounds a clock face that features the classical look of a grand staircase at the bottom of the clock. Size: Height - 19.7" x Width - 15.8"
Every hour the face splits into three parts to reveal rotating crystals from the Swarovski crystals while playing one of twelve popular, classical or six Christmas melodies. The spinning wheel with four crystals from Swarovski components rotates continuously. 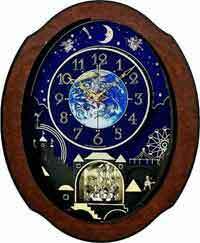 Real wooden frame with a light sensor which will turn off the music in the nighttime hours. Demo button will cycle through songs at any time. One year warranty and Free Shipping. Unique Rhythm Fiddler Musical clock is inspired from the shape and style of a fine violin, functions as an accurate clock and plays 30 different melodies. Clock is battery quartz operated. Feature a Demo Button for a song on demand, Auto Night Shut-Off and a Volume Control One year warranty and Free Shipping. Size: 19.17"H. x 6.97"W. x 2.76"
The Caprice's simple and elegant design will catch the attention of the traditional eye. 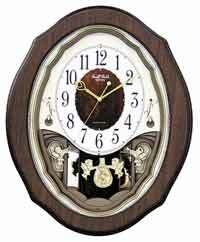 Encased in a frame with a burl print on the front, the clock plays one of 30 melodies on the hour. The center piece of this model is the artistic looking pendulum. This is definitely a great addition to any home. Clock is battery quartz operated. One year warranty and Free Shipping. Size: 14.6" H. x 12.2" W.
The Rhythm Marble Snowflake a black faux marble frame with silver-tone accents. Swinging Swarovski Crystal pendulum sparkles against a mirrored backdrop. Accurate Quartz movement with 18 melodies that play on the hour with an Auto Night Shut-Off, volume control, On/Off Switch and a demo button. One Year Warranty and Free shipping. 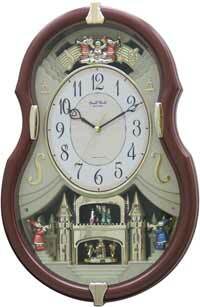 Size: 17.0" H. x 14.0 W.
The Rhythm Crystal Delight Small World Musical Clock will play one of 30 melodies on the hour. The wooden frame has an espresso finish with a silver etching on the glass. The swinging pendulum has 4 genuine Swarovski crystals inset into the pendulum that sparkles as it moves back and forth. An easy to read white dial has silver accents and the 4 additional small Swarovskis on the quarter hour positions. 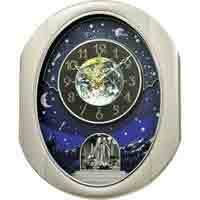 This Small World Musical Clock offers Swarovski® Elements, Demo Button, Auto Night Shut-Off, and a Volume Control. Clock is battery quartz operated. One year warranty and Free Shipping. Size: Height 17.1" Width 13.8"
With 4 cherubs accenting the crystal pendulum surrounded by a wooden frame the Rhythm Precious Angel clock will fit any decor. This clock has 18 different Melodies in 3 different banks. (6 Hymns, 6 Classic Melodies, and 6 Christmas Melodies) On the side of the clock you just flip a switch to make your selection of which group you wish to hear. This clock also features a demonstration button, auto night shut off, volume control, 2 D cell batteries are included. One year warranty and Free Shipping. Size : H 17.3", W 15.9", D 2". The elegance of the Joyful Snowflake makes it a great gift for a wedding or an anniversary. The golden bells on top add a special touch to the artful design of columns and mirrors below. The comforting swing of the crystal pendulum sparkles against the backdrop. 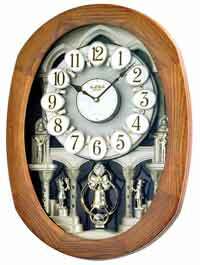 Add to this, 18 superior quality melodies (with 6 Hymns) that play on the hour and you truly have a beautiful clock. Clock is battery quartz operated. One year warranty and Free Shipping. Size: 17.0" H. x 14.0" W.
Geotrust Secure Site assures you of a secure transaction. Every page is secure, not just your checkout page. 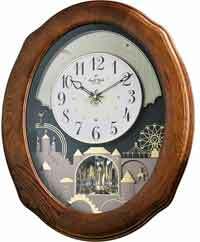 Grandfather Clocks by Howard Miller Grandfather Clocks, Quality Mantel Clocks, Wall Clocks, Curio Cabinets and Alarm Clocks.